We picked up two of our grandchildren from nursery school and walked them back to our apartment through Central Park. There was a recent snowfall and Robbie (age 3 1/2) and his cousin Sydney (age 4) were having a fabulous time making and throwing snowballs and our progress was really slow. 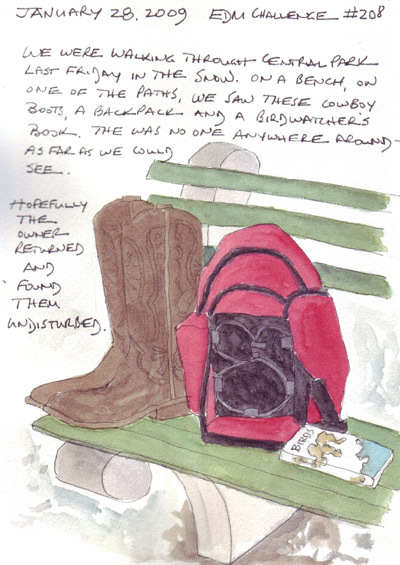 On a bench, on one of the paths in the middle of the Park, we saw a beautiful pair of brown leather cowboy boots, a new red and black backpack, and an open bird watcher's book. We regularly watch Law and Order, so my husband and I looked at each other suspiciously and for an instant wondered whether we would next find a body. There were no people anywhere in sight - in any direction. I took a photo so I could show a Park staff member when we passed one of the them on the second half of our journey. We never heard more about the event and hopefully the tourist who left them there was able to retrieve their stuff when they returned. 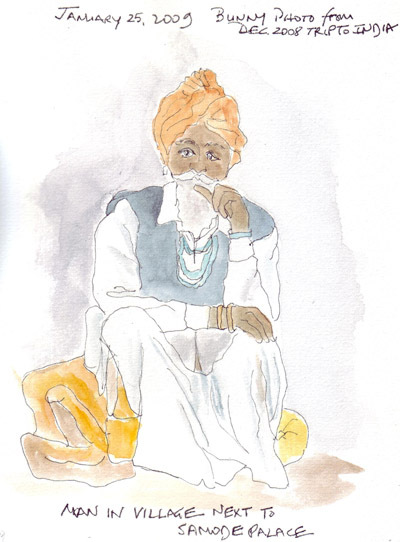 I love my friend Bunny's photos from her trip to India and look forward to sketching and painting some of these interesting people in their beautifully colored clothes. It is a joy to look at her albums for specific photos for my figure drawing practice. This year, as I practice, I will continue to add faces to my figures. 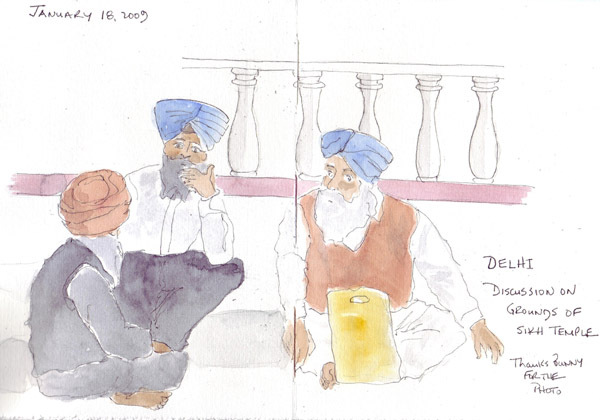 Older readers of this blog may remember that I sketched figures or faces, but never together, through much of 2008. I still have several more figures that I would like to paint from Album #3 - and then 12 more albums to go! Thanks again Bunny. 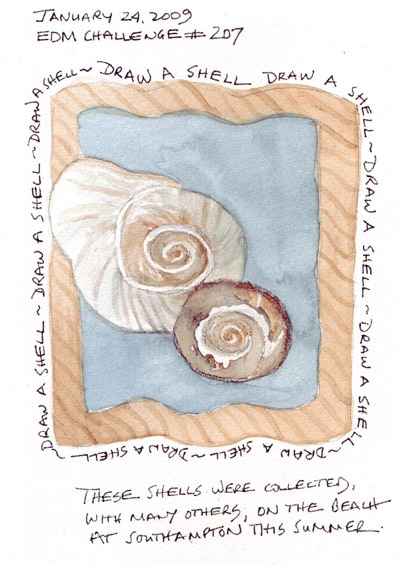 I'm so happy that I brought a few of my favorite shells home from the beach this summer. 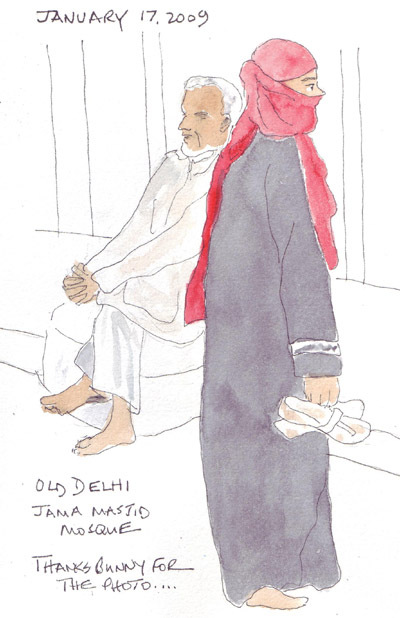 I sketched and painted many when we were taking our morning walk, but our grandchildren played with most of them and I saved very few. One of my dear friends and her husband spent at least a month visiting their son and his family in India. I know we will never be there on vacation, so I asked her to share all of her wonderful photos with me. 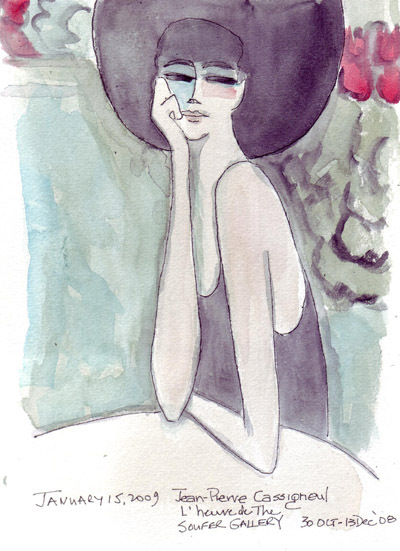 I plan to slowly look at all of the digital photo albums she shared and to draw and paint some of the people. Here are my favorite photos from the first 2 albums. 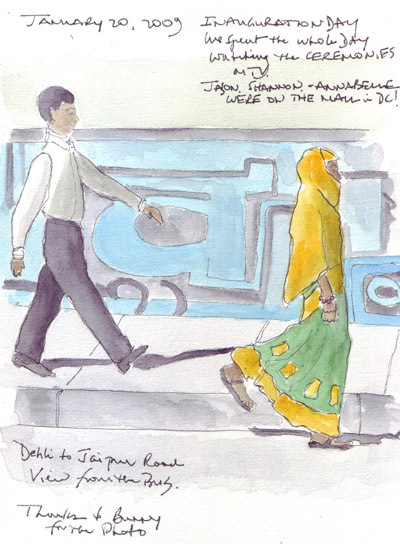 Learning more about drawing figures and faces is still a primary goal for me in 2009. One of the members of Everyday Matters (EDM), the online art group that I belong to, posted links to out of print figure drawing books by Andrew Loomis and I'm working my way through the first chapter of Figure Drawing For All Its Worth. 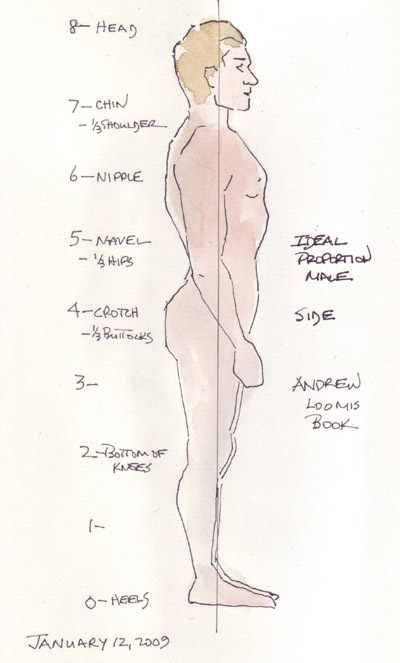 Here are journal pages that I did of ideal male proportions - trying to embed these landmarks in my brain. 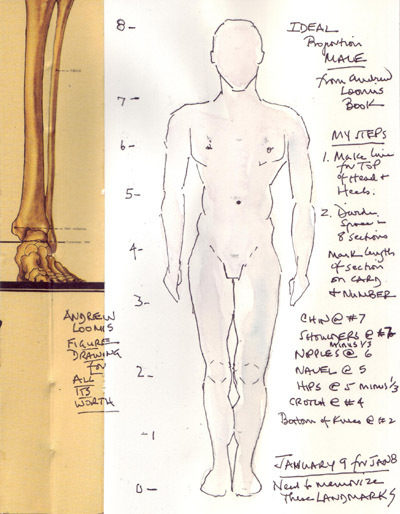 The anatomical drawing is a piece of an end paper in this book I recycled. My angst re: gaps between signatures using 140lb watercolor paper can be seen here. I love drawing and painting ballet dancers - all from photos because I'm still not able to sketch moving bodies. This was drawn from a photo in the NY Times last week. Obviously, I shouldn't have tried adding facial features in this tiny little face - but I'm posting the disappointments as well as the pages that please me. 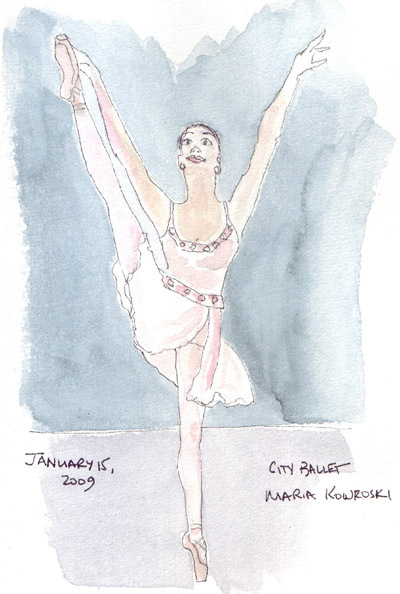 The drawing inspired us to get Ny City Ballet tickets for February, to brighten an otherwise cold, dreary winter. 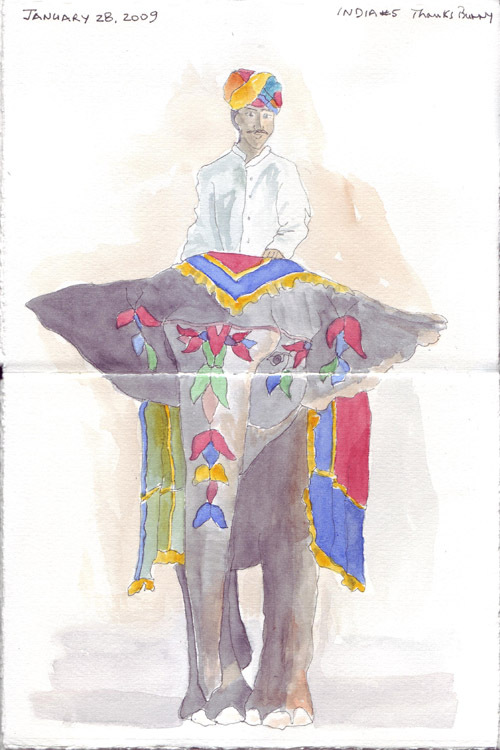 I still had to do a daily journal page the other evening, and this painting, on a postcard from a local Manhattan gallery, was sitting right next to me. I love trying to learn from other artists by copying their lines and painting styles - oil to watercolor conversions. I didn't know anything about Jean-Pierre Cassigneul, but subsequently learned that he was born in 1935 and is a well known French artist - with a painting in the upcoming Christie's Impressionist and Modern Auction. Here is my fast copy of his beautiful oil painting.